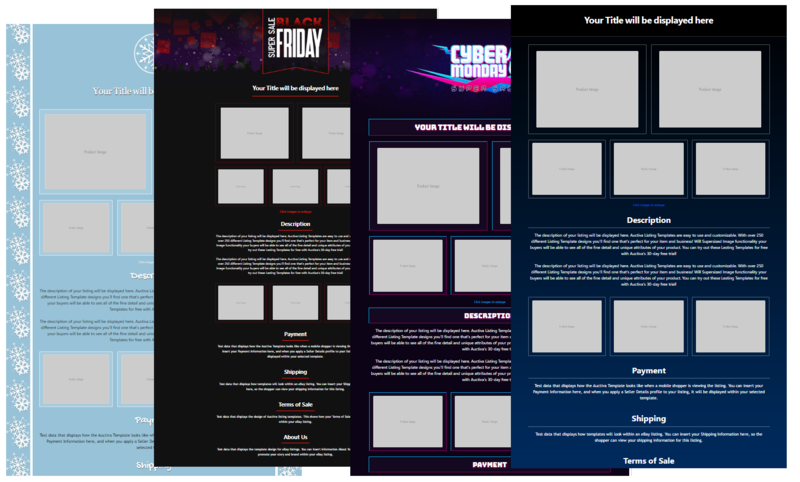 New listing templates for Black Friday, Cyber Monday and Winter are available! Exciting news for the holiday shopping season! We just released a set of Listing Templates for Black Friday, Cyber Monday, as well as a some additional Winter themes. Listing Templates are a powerful marketing tool you can use to help boost sales for your seasonal products and gifts.They allow your buyers to see all of the fine detail and unique attributes of your products, meaning they’re likely to purchase quicker. You can check out these seasonal templates by looking in the “seasonal” category in the template selector.